This cultivator is a tool for loosening hard, heavy soil or soil compressed by rain. By loosening the soil weeds lose contact with the soil and dry out. 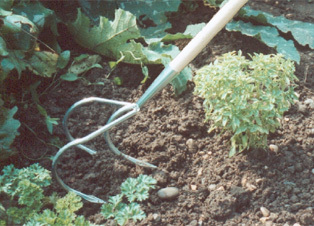 It is also an excellent tool to mix compost, manure or fertiliser into the soil. It is possible to work between plant rows as the tool is only 16 cm wide. The three teeth of this cultivator are forged and made from alloy steel.